Flatiron has recently been expanding its repertoire of incredible new restaurants, for both quick eats, as well as for a more elevated dining experience. I’ve teamed up with S.Pellegrino ® to bring you my neighborhood guide of must-try places in Flatiron as part of the S.Pellegrino ® Taste Guide to NYC. 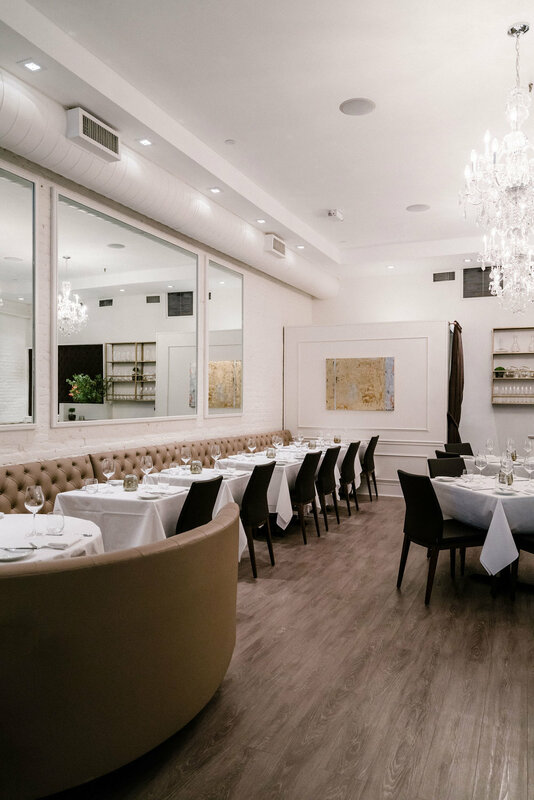 Chef-owner Scott Conant opened Fusco in the old Veritas space, and from the first step inside, through the entire dining experience, the restaurant delivers class and elegance with its seasonal fine Italian fare. The chandeliers are ever so charming, and the space is perfect for a romantic date. The Pasta al Pomodoro, or Chef’s Signature Regu, is a must-try. Atoboy, opened by Jungsik-alum Chef Junghyun Park, and his wife Manager Ellia Park, serves Korean tasting menus small plates-style (banchans with rice), and aims for fine-dining to be more casual and modern. The industrial feel of the space goes oh so well with the cool, scrumptious dishes. Jean-Georges Vongerichten is no newcomer inside ABC Carpet and Home (he already has ABC Kitchen and ABC Cocina), and abcV is the latest to join the duo. abcV has the same clean and minimal decor, and is essentially a Vegan restaurant, focusing on market vegetables, noodles, and grains. In the mornings, the doas and pancakes will leave your tummy and taste buds satisfied. Union Square Cafe is Danny Meyer's first restaurant serving seasonal New American fare in a casually refined setting. It is not a cafe, contrary to what the name suggests, but rather deems a fairly large space for a bar area as well as dual floor dining rooms. It has recently re-opened after originally opening nearly a quarter-century ago. It is a classic New York restaurant and was one of the originators of contemporary American cuisine. Originally located on Monmartre's Rue Lepic in Paris, this is French chef Antoine Westermann’s Le Coq Rico’s first location in the United States. Translated to The Bistro of Beautiful Birds, Le Coq Rico specializes in sophisticated poultry dishes, paying tribute to responsibly raised whole-animal meats. View more of my NYC neighborhood guide feature on sanpellegrino.com.